–Emily Fox Kales, Ph.D., founder of Feeding Ourselves, Inc.
As I sit down to write this introduction, I can’t help pondering my own relationship with food. It is ten o’clock in the morning and before I began writing, I enjoyed a light breakfast of a toasted bagel with butter and a glass of orange juice. To many people, that would not be a big deal. 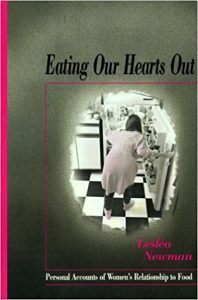 But to others, including the 92 contributors to this anthology, the act of actually enjoying breakfast, the fact that I ate both halves of the bagel because I was hungry, the fact that I used real butter instead of diet margarine, the fact that I didn’t add onto my breakfast a second bagel and then a third and then some ice cream and cookies to boot, and the fact that I didn’t stick my finger down my throat to get rid of my food is nothing short of a miracle. Before you read on, think back to what you ate yesterday. Picture yourself eating at the kitchen table, in a cafeteria or restaurant, at your desk, in your car, on the street or wherever it was you happened to eat. What did you eat and whom did you eat with? Can you remember the foods you chose to nurture and feed yourself with? Did you eat what you were hungry for or did you eat what you thought you should? Were your choices made according to your desire for certain foods or to change your body size? Were your choices affected by whom you were eating with? Did you say after eating anything in particular, “I shouldn’t have eaten that”? Did you eat less than you wanted or needed? Did you spend the day calculating your calorie intake? Did you get rid of your food by vomiting, over-exercising or abusing laxatives or enemas? And lastly, did you enjoy your food? As I write this, an extraordinary memory comes back to me. About thirteen years ago I was sitting in a health food restaurant with a new friend of mine, Anne. It was lunchtime: I ordered miso soup because I was on yet another diet, and Anne ordered vegetable tempura. The waiter came back with our meal: a pathetic little bowl of broth for me, and a huge dish of batter-dipped fried vegetables for Anne. Anne did not say, “Oh my God, that’s too much,” or “I’ll never eat all this,” or any such comment I was so used to hearing. As I delicately sipped my soup, she used her fingers to dip a big piece of fried yam into some soy sauce and then scrunch the whole thing into her mouth. With great gusto she ate piece after piece of tempura—zucchini, eggplant, potato, broccoli, cauliflower, string beans, all deep fried—without once apologizing for the unabashed way she was satisfying her appetite. When she was done, Anne wiped her chin with her napkin and sipped her tea with a quiet look of contentment. I was astonished. I was pretty sure Anne hadn’t just binged, as bingeing was something one did in private like me. Somehow Anne didn’t strike me as a woman who was always on and off ridiculous diets. And she, unlike a true dieter out to cheat on her diet, had actually left on her plate a few pieces of mushroom tempura which I coveted but of course was too shy to ask for. No, Anne had actually enjoyed her meal with no pangs of guilt afterwards. I had never seen a woman eat like that before…..